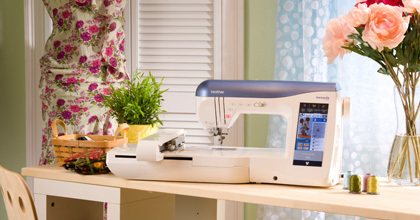 The Brother Innov-ís 2800D offers an oversized color LCD touch screen, a 10 inch x 6 inch embroidery area and precise stitching for all your sewing, quilting and embroidery projects. The built-in dual USB ports allow you to connect your machine directly to your computer or access a variety of additional memory devices (not included). Newly added to the Brother Innov-is 2800D is the Automatic Height Adjuster™ AHA® Feature where you can achieve perfectly formed stitches as you sew over varying fabric thicknesses. It's perfect for stitching quilts with varying fabric types, appliqués or embellishments. Powerful on-screen editing features include layout, pattern rotation in 1 degree increments, mirror imaging and scaling. Select stitches, embroidery patterns, tutorials and more by simply touching the large color screen.